The Lodge in the Vale017687 73331work Guest AccommodationNew development for 2010, The Lodge in the Vale, near Keswick. Just completed in the heart of the Lake District National Park is the stunning Lodge in the Vale. Located between Keswick and Grasmere just off the main A591, it is in one of the most picturesque locations in the area. 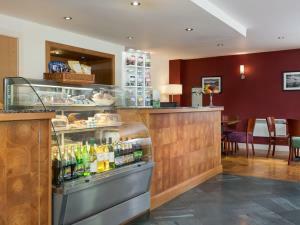 At the heart of the Lodge is the all day coffee shop and bar which serves continental breakfast in the morning and coffees and snacks throughout the day. Surrounding The Lodge is some of the finest scenery in the Lake District. Direct access to Helvellyn can be gained Via the white stones route just South of the Lodge adjacent to The Kings Head Hotel. The Northern fells of Skiddaw and Blencathra rise in the distance creating the perfect backdrop to any Lake District break or holiday. Its cenral location in the National Park is second to none. ‘this is a very exciting and prestigious development for us and adds to our ability to cater for visitors to the area in addittion to our existing more traditional properties. It will appeal to customers who want modern contemporary accommodation with flexibility for dining out. It will also be perfect for small conferences, meetings and training courses and has been fitted with the most up to date communication and audio visual technology. We are really looking forward to welcoming both new and existing guests to what we feel is a unique development in the fabulous Lake District. The Lodge in the Vale sometimes limits bookings to 2 or more days. Brand new for July 2010. New development for 2010, The Lodge in the Vale, near Keswick. Just completed in the heart of the Lake District National Park is the stunning Lodge in the Vale. Located between Keswick and Grasmere just off the main A591, it is in one of the most picturesque locations in the area. The location is perfect for exploring the area, just stopping overnight on a journey to Scotland or travelling South as the transport communications are second to none. For those guests who do want full bar and dining facilities our King's Head Hotel & Inn is just minutes away, which has both a fine dining restaurant and gastro bar food dining room, as well as a shop selling local gastronomic specialities and gifts. All these facilities are available to residents of The Lodge. Children welcome from any age. From the north, exit the M6 at jct 40 and take the A66 toward Keswick. Before Keswick turn onto the A591 toward The Lodge in The Vale is located 6 miles south of Keswick just off the A591 signposted to St John-s in the Vale. From the south, sxit the M6 at jct 36 and take the A590 toward Windermere and the A591. Continue to Thirlmere and The Lodge in the Vale located 20 miles to the north of Windermere just off the A591 signposted to St John's in the Vale.